The Walter M. and Loretta B. Casey House is a Spanish Eclectic, Monterrey style. Spanish Electic (also known as Spanish Colonial Revival) buildings are characterized by Spanish style, red fired clay tile roofs, adobe simulated stucco walls, and sculpted stucco chimneys. Typically, Monterrey subtype architecture is identified by a second story with balustrade balcony accessed by French doors. The second story is usually rectangular in plan and exhibits a low relief, hipped or gabled Spanish tile roof. All these traits, including a east side sleeping porch, wood casement windows, Medieval door, multi-pane windows, upstairs cement grill, and interior arched Medieval doors characterize this high-end Bathrick Bros. Building Company of Pasadena speculation house. One of the first occupants of this house, Walter M. Casey owned a successful Ford dealership in downtown San Diego. As a member of the San Diego business community and Chamber of Commerce, Casey co-founded the Civic Affairs Conference and helped elect Percy Benbough as mayor along with three new city councilmen, who in turn changed San Diego to a City Manager form of government. 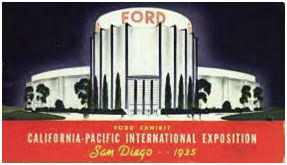 Casey also convinced Edsel Ford, president of the Ford Motor Company, to become a major sponsor and exhibitor at the 1935-1936 California-Pacific Exposition and to build the enormous Ford Exhibit Hall as a star attraction. To do that, Casey had to convince Ford that San Diego was not a hotbed of corruption. Casey and the Civic Affairs Conference succeeded in cleaning up the city council and obtained a referendum for city manager government. Their success at sweeping city hall clean won Ford over. Ford Motor Company built the fabulous Art Deco style Ford Building with its cavalcade of progress exhibits. The Ford Building, at the south end of the Plaza de America, was considered by many to be the Exposition’s architectural wonder. Designed by Walter Dorwin Teague, the 90-foot tower was designed to look like a gearwheel laid on its side. One of the most popular buildings at the 1935 California-Pacific International Exposition, the Ford Building, once considered for demolition, is now the Aerospace Museum and listed on the National Register of Historic Places, and was the first Modernist resource designated by the City. This house retains great architectural integrity inside and out. Our thanks to Ron V. May and Dale May of Legacy106 for the information from the historical designation report for this house.